Well lookie here, summer's almost gone and I bet you didn't even notice there hasn't been a Blainletter since July. Seems I'm not too motivated to get one out when there's no gigs to promote and August was a quiet month – very quiet. And I didn't even get down to Cape Cod this summer…or even to my sister's pool in KW. I will also be playing with Michael THIS FRIDAY NIGHT (Sept 1) at the Thornhill Pub. It's an early set 7pm start. If it's nice we'll be playing on the patio. And on Saturday, September 9 (nice or not) I'll be playing on Stage #1 at the Southside Shuffle in Port Credit with Mark "Bird" Stafford doubling on drums and harmonica as only he can do. Get there early because we're the first ones up on that stage at 1PM, immediately followed by the Street Shuffle with blues bands up and down Lakeshore Blvd. Once Toronto Jazz was over, I was able to enjoy a few of the festivals that happen in and around Toronto, some like Beaches Jazz and Afrofest are just a walk away and one, the Festival of South Asia, was actually at the foot of my street. The last week-end of Beaches Jazz finished off with MonkeyJunk and Paul Reddick (together) and they did not disappoint. 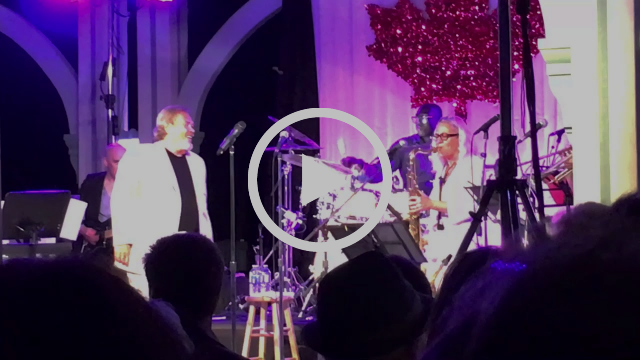 I caught a few other shows over the course of 3 week-ends – they might be stretching their festival a little thin by taking up the entire month of July but I'm not complaining – I could just walk down the street and hear what I wanted. 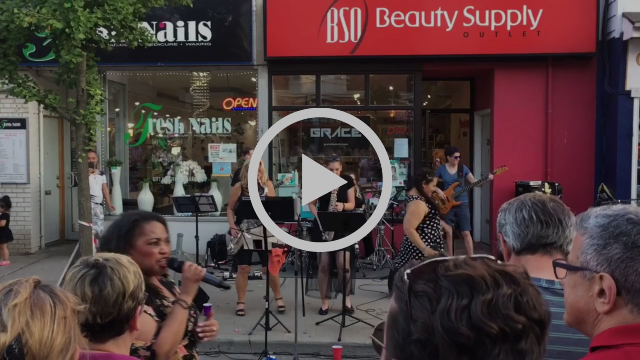 Beaches Jazz had some great moments and you can check out my compilation video of the Streetfest. I went to the Steetfest on the Thursday night because Friday & Saturday are such a crush of people. I used my new app to track how much I walked - 13k! The success of Streetfest might account for the not-so-great attendance at the main stage. After seeing Afrofest completely fill that huge park, the jazzfest looked kinda lame, but provided some great music nonetheless. Afrofest was a great thing to experience but, like the Festival of South Asia, they are community events and the provide the entertainment that their community wants – not necessarily world renown sitar players or kora players. More like wedding fashion shows, little kids dancing to pre-recorded tracks and young handsome singer/dancers doing afro-hip-hop. Ironic that to hear the great masters of those music cultures you have to go to a Small World event at the other end of town where the audience is predominantly white baby boomers. A few tunes into Shawn Kellernan's afternoon set, he invited a 13 year old called Avalon Fraser to sing a tune and get a taste for the big stage. Right after, Lucky Peterson hit the stage with him and basically took over the show. Shawn was glad to oblige - never being known as a powerful singer. I missed most of David Wilcox set but caught this little moment when he acknowledged a young gal's birthday. Then over to the tent to hear Tarbox Ramblers (this was a band I had wanted to see for years but had a totally different idea of what their music). It's rough and ready hill country tuning-optional blues a la R. L. Burnside. Then Ann Vriend - a fabulous singer - with Rooster Davis. 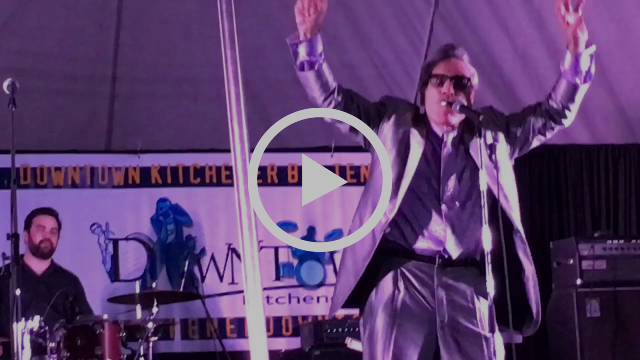 And finally the main attraction for me - Rick Estrin and the Nightcats. I was excited just to hear Rick - a real eccentric bluesman - but before the set, my friend Larry told me Kid Andersen was playing guitar. I had never heard of Kid Andersen until Rockin' Johnny Burgin told me about him. I played bass for Johnny when he was in town and he gave me his recent CD - produced by, who else, Kid Andersen. He plays on it too and after seeing him live, I think he's my new favourite blues guitarist. 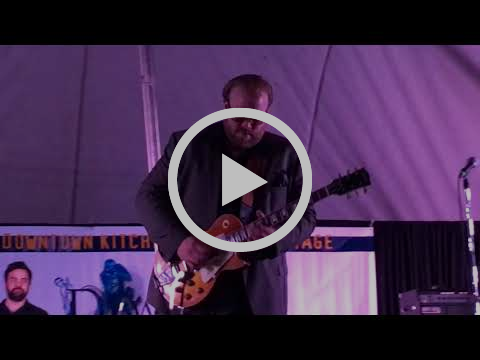 For the true guitar aficionados, here's the entire clip of Kid Andersen's version of Lonnie Mack's classic guitar instrumental, "Wham"
As always, lots of great music in and around this town, and I hope I can continue providing some of it. August was bereft of gigs for me but lots coming up in September so I hope to see you at one of my gigs sometime. Now Southern Texas, the birthplace of so much of the blues music we love, has come under another assault from Mother Nature and it is heartbreaking to watch all the hardship those folks are going through. The Jazz Foundation brought over 1000 musicians & their families back after Katrina, by rehousing, donating top shelf instruments and creating paying gigs for hundreds and they have started connecting with dozens of jazz, blues, and roots musicians in Harvey's wake, to help them rebuild, repairing homes, replacing belongings and treasured instruments and even replacing work. If you want to help, go to jazzfoundation.org/donate. Closer to home, the entire music community has been sending good vibes to A Man Called Wrycraft who designed practically everybody's CD cover (including mine) and is now undergoing some pretty radical life-altering surgery. Somehow he's still posting humourous and encouraging messages on Facebook so no doubt he'll be back in action before we know it. And just today we got the news that Canadian music pioneer, Lighthouse co-founder Skip Prokop, has passed away. Another one bites the dust. Hope you appreciate our bountiful life here in Canada like I do. Every day. I didn't think I'd get to the Kitchener Bluesfest this year - there were some great African guitarists at Harbourfront so I would not be deprived of great music - but thanks to my friend Laila's prompting, I decided we would make the trek and I'm glad I did. I found out after that the Friday night got mostly rained out. Lachey Doley (yes, Clayton's brother) had to end his set after only a couple of songs and Paul Reddick and Lucky Peterson didn't get to play. A few tunes into Shawn Kellernan's afternoon set he invited a 13 year old called Avalon Fraser to sing a tune and get a taste for the big stage. Right after, Lucky Peterson hit the stage and basically took over the show. Shawn was glad to oblige - never being known as a powerful singer. I missed most of David Wilcox set but caught this little moment when he acknowledged a young gal's birthday. Then over to the tent to hear Tarbox Ramblers (this was a band I had wanted to see for years but had a totally different idea of what their music). It's rough and ready hill country tuning-optional blues a la R. L. Burnside. Then Ann Vriend - a fabulous singer - with Rooster Davis. and finally the main attraction for me - Rick Estrin and the Nightcats. I was excited just to hear Rick - a real eccentric bluesman - but before the set, my friend Larry said Kid Anderson was playing guitar. I had never heard of Kid Andersen until Rockin' Johnny Burgin told me about him. I played bass for Johnny when he was in town and he gave me his recent CD - produced by, who else, Kid Andersen. He plays on it too and after seeing him live, I think he's my new favourite blues guitarist.